For the video game, see Bubble and Squeak (video game). For the album, see Bubble and Squeak (album). Bubble and squeak is a traditional English dish made with the shallow-fried leftover vegetables from a roast dinner. The main ingredients are potato and cabbage, but carrots, peas, Brussels sprouts, or any other leftover vegetables can be added. The chopped vegetables (and cold chopped meat if used) are fried in a pan together with mashed potatoes or crushed roast potatoes until the mixture is well-cooked and brown on the sides. The dish is so named because the cabbage makes bubbling and squeaking sounds during the cooking process. It is often served with cold meat from the Sunday roast, and pickles or brown sauce, or as an accompaniment to a full English breakfast. 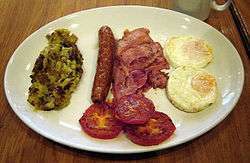 The meat was traditionally added to the bubble and squeak itself, although nowadays it is more commonly made without meat. The earliest known recipe was in Mrs Rundell's A New System of Domestic Cookery in 1806. 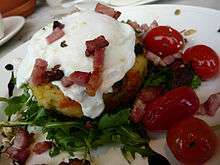 The name bubble and squeak is used primarily in England (for Scotland and Ireland see 'Similar dishes'), and it may also be understood in parts of some other Commonwealth countries and the United States. Bubble and squeak was a popular dish during the Second World War, as it was an easy way of using leftovers during a period when most foods were subject to rationing. In more recent times, prepared frozen and tinned versions have become available. ↑ Rundell, Maria Eliza Ketelby (1808). Bubble and Squeak. In A new system of domestic cookery:Third edition. p. 42. Google Book Search. Retrieved on January 6, 2011.